Team: San Diego Padres Washington "Nat'l Lea." 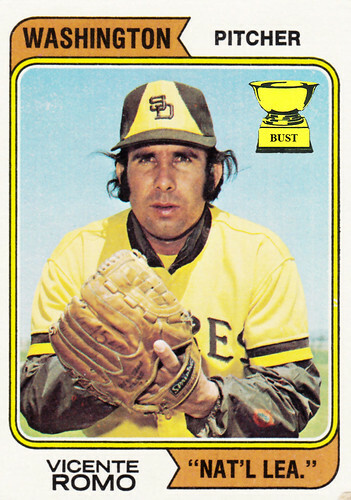 Jumping the gun: In 1974, it appeared that the San Diego Padres were about to be sold and moved to Washington, D.C. Topps, with its high standards of quality (*cough*) decided it would print its set on the assumption the sale would go through, replacing the city and team name, even though the latter wasn't yet known (hence the ever-so-helpful "Nat'l Lea."). However, McDonald's owner Ray Kroc stepped in at the last minute and purchased the Padres, keeping them in town with no changes not even in their terrible play or bodily function-colored uniforms. And now, a quiz: How can we tell Vicente Romo is expecting to relocate, based on his above photo? (A) He's pointing up toward the air, either at a plane or the home run ball he just surrendered. (B) His sideburns distinctly resemble an aircraft's landing gear. (C) His uncut hair appears to be flying away from his body. (D) He's wearing a parachute as an undershirt.